All primary schools in Lewisham are invited to this free training event on food growing at school. The session will cover a range of topics: linking food growing to the curriculum, exploring whole school/environment benefits, how to get started and how to further develop food growing at school. There will be a Q&A tour of Kilmorie’s extensive growing beds led by the school gardener and all attendees will be given a resource pack to take home. This promises to be an inspiring session for those keen on developing their growing activity or just thinking about how to set it up. The session is free to attend, please register your interest with Nick Ives, nives@gardenorganic.org.uk, or call 07454519749 to hear more details. Junior Gardeners’ Question Time panelists from Trafalgar Infant School (Richmond), Rokesly Junior School (Haringey) and Reay Primary School (Lambeth). Photo: Jane Baker/Garden Organic. From strawberry jam to tomato ketchup, and the great British apple to winter salad bags – young entrepreneurs from 10 London schools shared their food growing skills with the public at City Hall on Thursday 13 October 2016. They represent the increasing number of London students experiencing the huge benefits of food growing since the launch of Food Growing Schools: London (FGSL) in 2013. On Thursday 13 October 2016 during a unique FGSL Celebration Event, students showcased their school-grown produce at the sixth FGSL Schools Marketplace, run in partnership with Capital Growth, and took to the stage in the prestigious London’s Living Room. The event was opened by Joanne McCartney AM, Deputy Mayor for London, and Deputy Mayor for Education and Childcare, for the Greater London Authority. It included the launch of the FGSL Interim Report (October 2016), showing the wide ranging benefits of food growing. There was also FGSL’s very own Junior Gardener’s Question Time, chaired by former Blue Peter Gardener Chris Collins – with food growing questions answered by children from schools across London. Students from schools in Croydon, Ealing, Greenwich, Haringey, Kensington and Chelsea, Lambeth, Lewisham, Richmond and Southwark took part, and won prizes as part of the *Schools Marketplace Competition. Since their launch in 2013, Food Growing Schools: London have seen an amazing 25 out of 33 London boroughs step up to promote food growing in schools. The Benefits of Food Growing are impressive and far reaching – showing a positive impact on children’s physical and mental health, environment and education, and the local community and economy. Nearly 80% of schools engaged with FGSL have reported improved behaviour or attainment in students as a result of food growing, and one in four schools now use food growing as a teaching tool linked to curriculum activities. 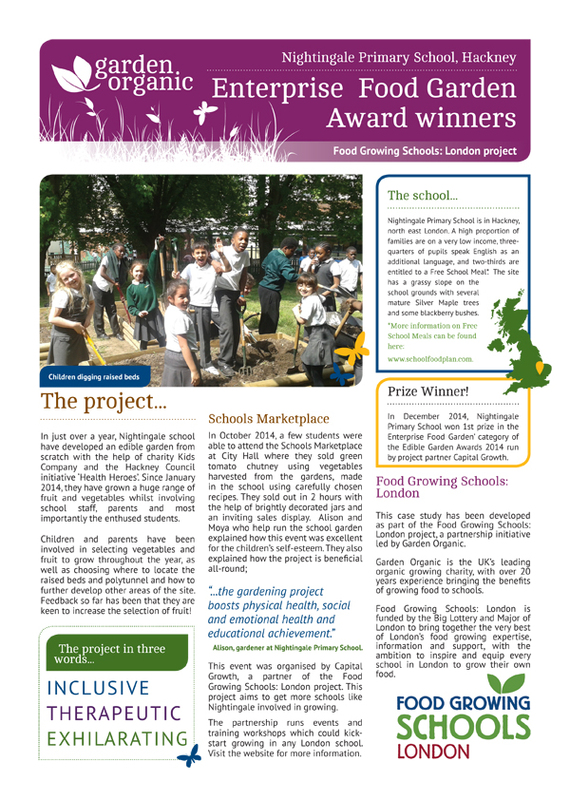 The FGSL report, containing the outcomes of an independent project evaluation by University of the West England, celebrates the successes of this innovative London-wide partnership, led by Garden Organic. The project is supported by the Mayor of London and the Big Lottery Fund. Speakers at the celebration event included Chris Collins (former Blue Peter Gardener, Broadcaster and Head of Horticulture at Garden Organic), James Campbell (CEO Garden Organic), Judy Orme (Professor of Public Health and Sustainability) and Mat Jones (Associate Professor of Public Health, University of West England). Whether you are already growing food in your school, you wish to get started, or you represent an organisation who can help, Food Growing Schools: London is open to all to Get Involved. *Figures based on evaluation surveys with lead school teachers in September 2013 (n=504) and July 2016 (n=241). The independent FGSL project evaluation was carried out by research teams from the University of the West England and Cardiff University.